My sister is an egghead. 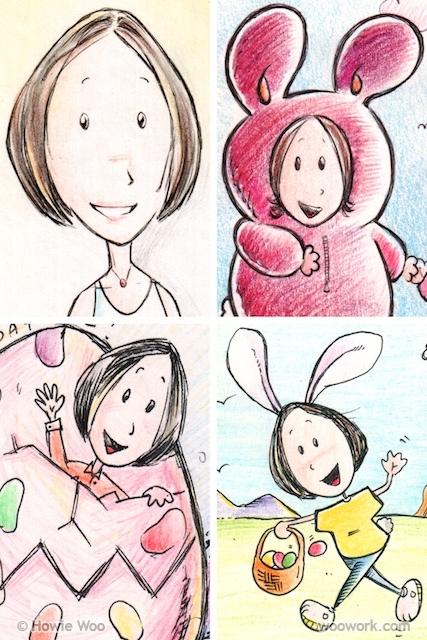 Also, her birthday is near Easter, which reminds me of Easter eggs. Happy birthday, sis! May your shell be strong and your yolk be sunny! Phew, good thing she liked it! I was worried for a minute there. My sister has a pinhead, I should draw her head on a pin. I'm not sure she'd like it as much as your sister liked her egg head though. jajajaja I loved the whole story! That's so funny! I'm so glad your family supports your creativeness with all their hearts. It's so sweet to see the little glimpses into people's lives and just how special each one is. Congrats on a truly one of a kind gift! Your english is perfect! Thanks for writing. Kitty Ballistic: Thanks! Every work break should be spiced up by crafting, non? ;) Your co-workers must swoon at all your creations. That is one precious ami-head of your super cute & funny sister! Good times were had by all apparently. Great job! Sharona: When I was setting up the lighting & camera gear for her closeup--then reminding her to stay in frame--my sis may have been thinking that I was something other than fun ;) haha I hope I'm fun some of the time, thanks! Miss Julep: My sister is known for her frequent laughter here, so it seems fitting to have those giggles spread onto the internet :D Thanks for the kind words! LOL! I like how she knew right away it was herself. Actually, I think my quote of the day is going to be "May your shell be strong and your yolk be sunny!" Hello, I followed you over from Bekahjan's! Your sister's egghead is the most adorable gift ever! I was just waiting for someone to say... "What a 'crack' up!" Okay, I'll say it too: May your shell be strong! Hi Kathy! I'm glad you hopped from Bekahjan's blog to visit today, exactly on Easter Monday. 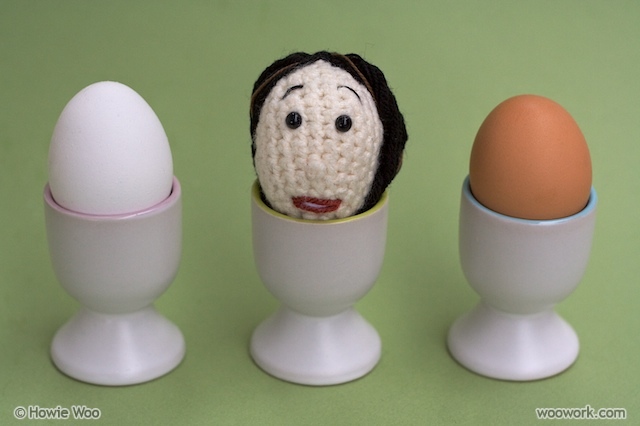 You hatched an eggcellent pun there, with the crack up ;) I'll be following your beautifully-photographed blog too, thanks! and i didn't know that u drew too! i checked out ur doodles and u can def see a lot of ur personality shining through.. just like ur projects! 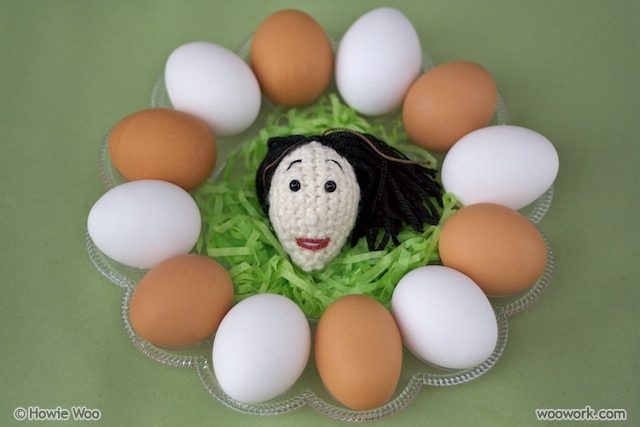 Thanks again for writing, Lisa :) I'm looking forward to seeing more of your adorable amigurumi creations this year! Thanks Meg! I have been trying to scribble down my stitches as I go, at least for future reference. As a beginner, I spend most of my time trying to fix my mistakes! absolutely fantastic... one of the funniest things i've seen in a long time! 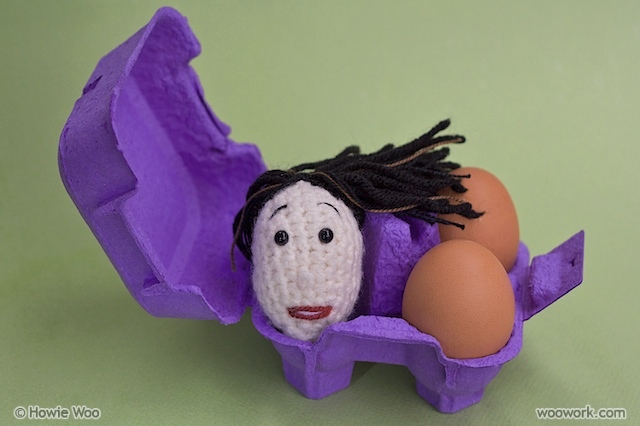 crookedcrocheter: Thanks, I'm glad you liked the slightly-morbid creation! Actually, my sister recently told me that her co-workers saw the egghead and said it looked creepy. "Did he put voodoo needles into it?"